The first teaser trailer for How to Train Your Dragon 2 has made its way online, appropriately teasing an animated film that doesn't hit theaters until June 20, 2014. 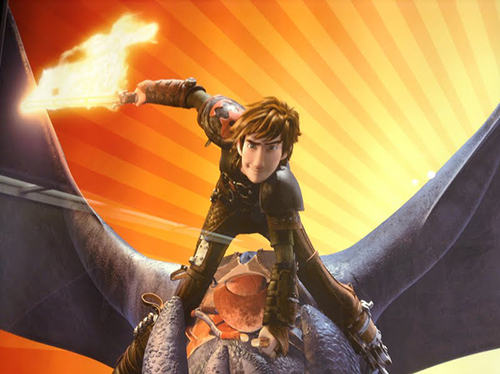 The big takeaway from this one is that our main character Hiccup (voiced by Jay Baruchel) has grown up and is slowly transforming into a bit of a dragon master, but even moreso than that this teaser reminds us that the first How to Train Your Dragon really was one of the most memorable 3D movies since the new era of 3D began. In fact, next to Avatar and maybe Hugo, How to Train Your Dragon is easily in our top five most memorable 3D movie-watching experiences. The thing was just gorgeous, and this teaser reaches back into our memory, yanks those feelings back out and says, "You ain't seen nothing yet." Picking up five years after the events of the first, part two finds Hiccup and his dragon, Toothless, as an inseparable duo who travel the skies in search of adventures. They find one in a mysterious ice cave that's home to hundreds of wild dragons and the Dragon Rider, a place that eventually injects the duo right into the middle of a new battle to protect the peace. Check out the teaser below and let us know what you think.